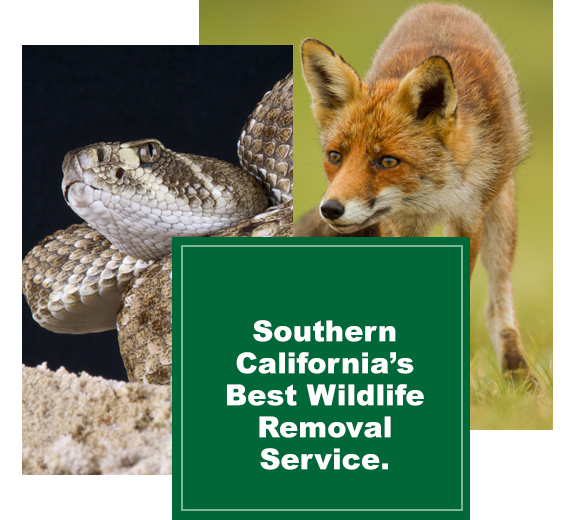 Wildlife Removal Services is a full service wildlife control company. We offer effective and professional humane wildlife control for our customers. Whether you need raccoon removal, skunk control, pigeon and bird control, rodent extermination, opossum removal, snake removal and prevention, bat removal and exclusion, damage repairs, attic restoration or cleanup, our professionals are the first choice in San Diego County. As San Diego grows and urban areas spread into adjacent open space, wildlife becomes more of an issue for residents. Most animals can adapt very well to urban environments. Raccoons find shelter in home attics, and skunks easily enter raised foundations. If you have a wildlife issue don’t attempt to take care of it yourself, Wildlife Control should be left to a professional. Here at Wildlife Removal Services, we have been trained not only to catch and control wildlife but to understand the dangers associated with them. Wild animals can become very aggressive, and carry hosts of diseases that can be damaging or fatal to you, your children, and your pets. Leave all of your wildlife control problems to a Wildlife Removal Services.